Oxford University Press World's Classics have a special place in our book collection - a purpose built bookcase in our main guest bedroom. 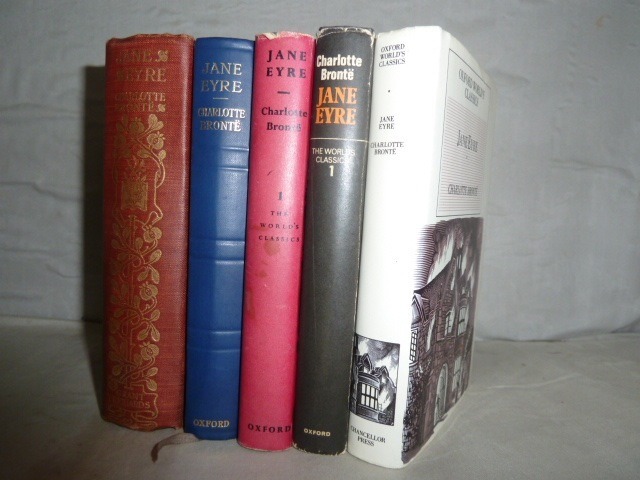 In this bookcase there are some 700 volumes spanning the whole series from "Jane Eyre" (No. 1) to "Mandeville's Travels" (No. 617). 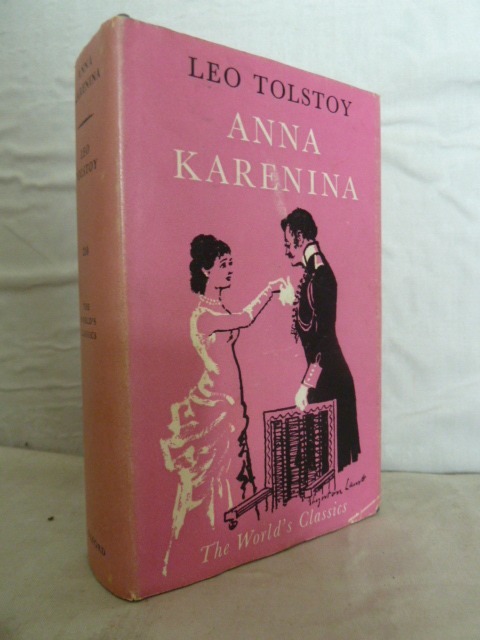 The first World's Classic I ever read was 'Anna Karenina', in 1968 when embarking on solid state physics research near Reading. 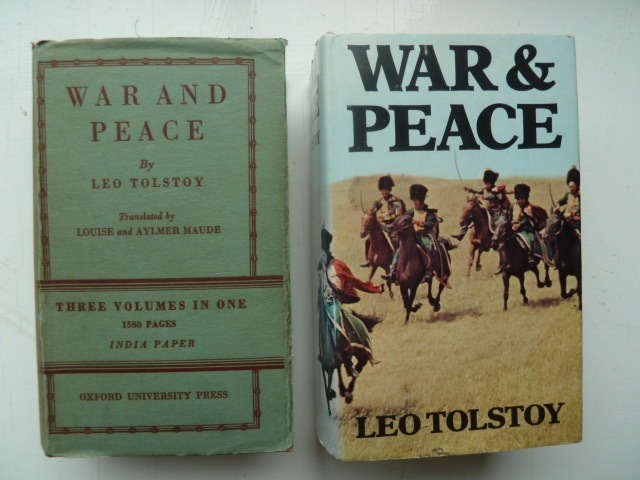 At that time I was in a Tolstoy phase and so it was good to find that he was an author well represented in the series, with no fewer than 20 volumes. 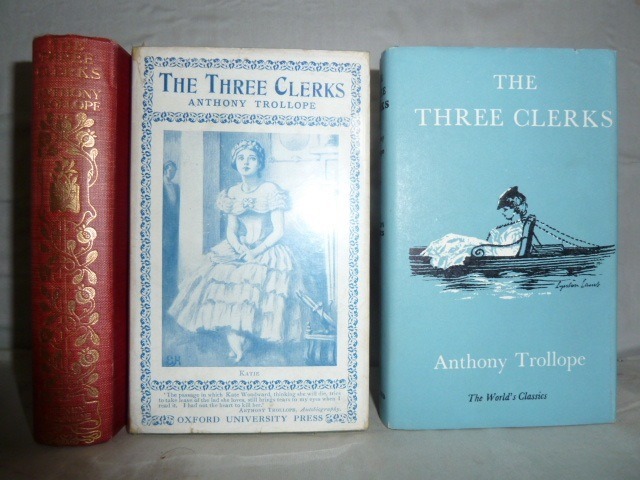 It was also a time when you could still buy World's Classics in new bookshops and over the next few years my wife and I added a number of Trollopes to the collection, both new and secondhand. 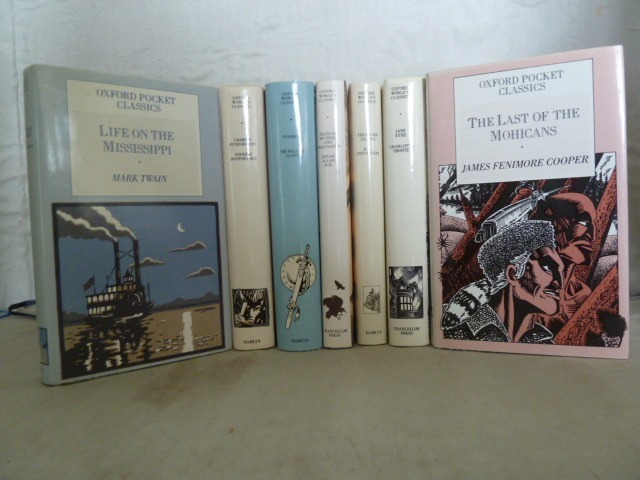 Trollope is the author with the most titles in the series, 36 in all, a virtually complete set of his novels. 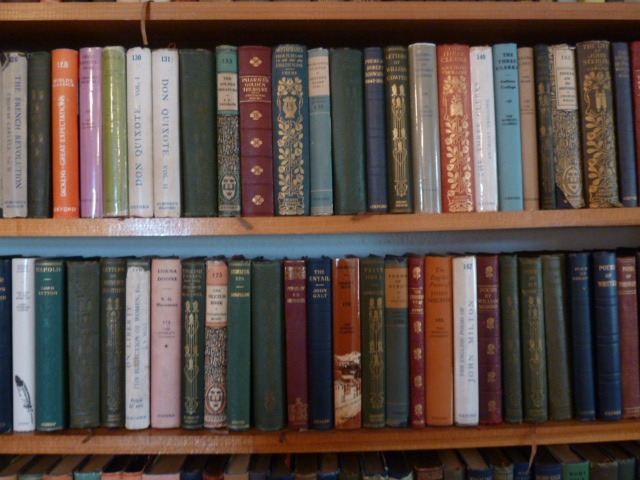 It was probably in the early nineties, when our book collection was growing in several directions, that we realised that we had some 10% of the World's Classics, a collection that had appeared on the shelves as by osmosis. It was then a logical step to make a more determined attempt to collect more of the series; well, alright, to collect all of the series. 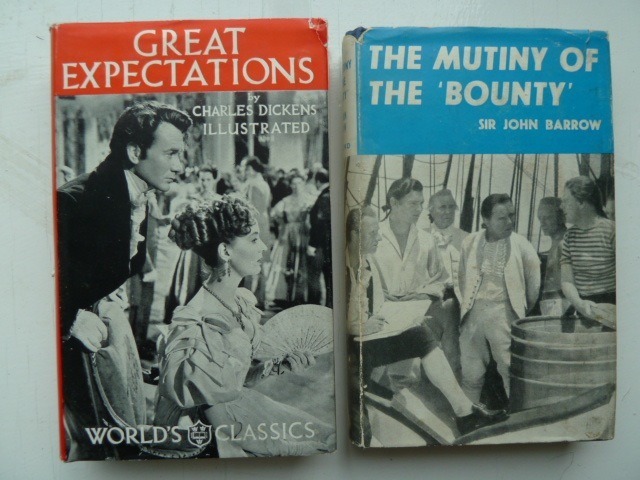 At first progress was rapid, as local bookshops were searched - then bookshops further afield; I recall a lovely summer day in York which ended in a glut of new titles. Then a never to be forgotten day in July 1995, when we arrived at the Book Barn in Henneker, New Hampshire, on one of our American trips when we sought out bookshops off the beaten track. It was my family who saw it first. 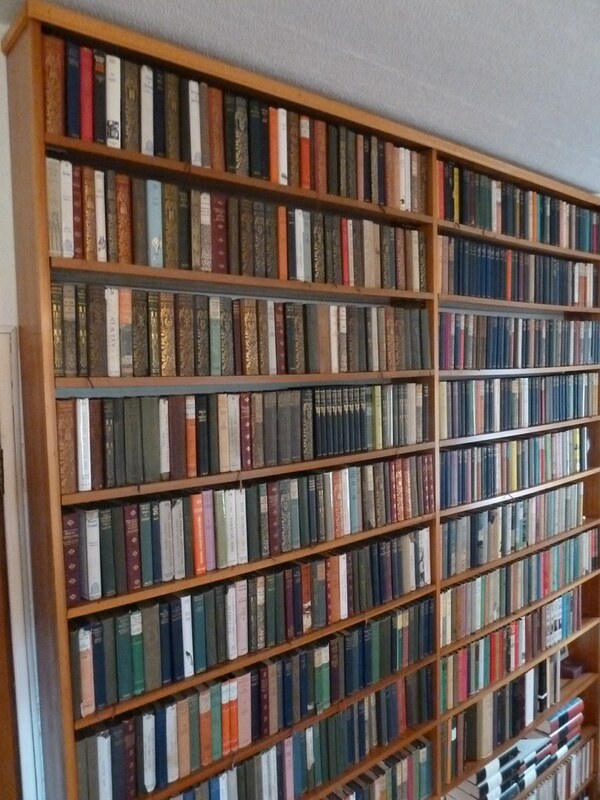 A whole bookcase full of World's Classics, perhaps 200 or so. I have a very understanding family and so they gave me carte blanche to add to the collection (and obtain finer and different copies of titles I already had). This endeavour was assisted by the most amenable of booksellers, who was in a particularly affable mood, in that post lunch period when life seems not so bad after all and discounting for quantity seems a neat idea. So, it is the late nineties and we now have, maybe, 75% of the series all bought in bookshops by good old-fashioned searching of the shelves. But we now had the internet and ABEbooks and Amazon, so we could have polished off the whole series fairly quickly. But, I REALLY ENJOY BROWSING FOR WORLD'S CLASSICS. So a GOLDEN RULE OF COLLECTING was formulated. 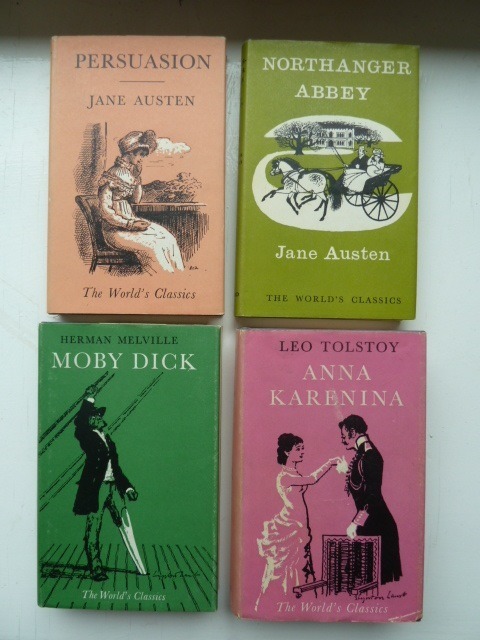 Put simply, this is that any World's Classic missing from the collection can only be added to the collection if it is purchased in a second hand bookshop or at a Bookfair by myself or my family. Seeking the bookseller's help is not allowed. I nearly fell into this trap when a bookseller in Harrogate said he had many more World's Classics in his reserve stock and did I want to see them. The look of horror on my face at this suggestion probably told him this was not a good idea (unless he attributed my blunt refusal to a misinterpretation of his intentions). Now the hard truth - there are 610 titles (7 of the 617 were projected but never produced). I am still missing 22. The rate of finding new titles is now down to about one a year. Bookshops are closing, I am getting older. I will never finish the collection and this is what gives it its special magic. 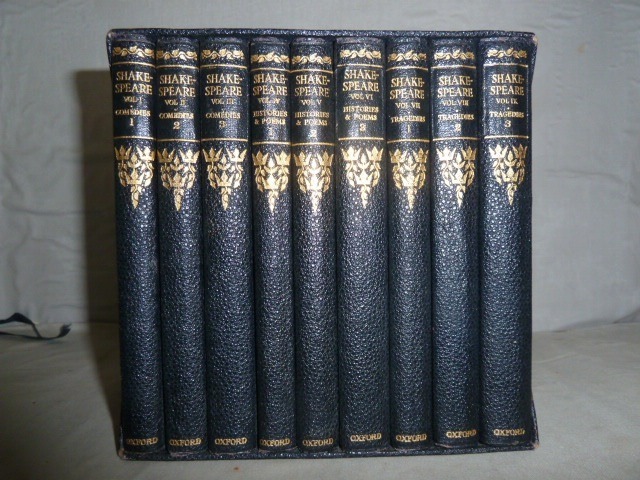 The first 64 volumes in the series were published by Grant Richards; the series was taken over by Oxford University Press (with no change of format) in 1904. 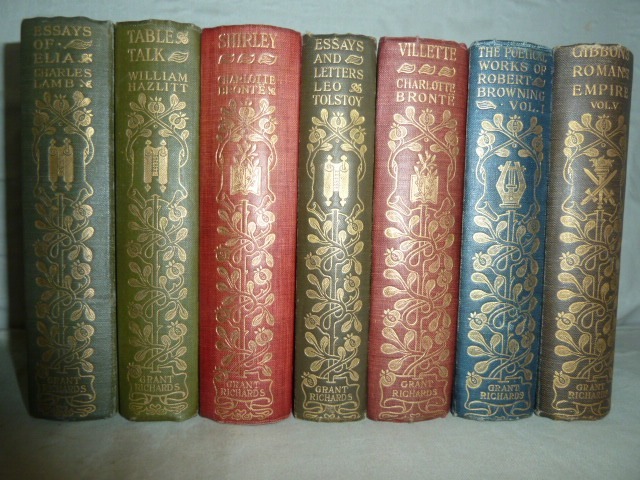 These early volumes, cloth bound with elaborate gilt titling and decorations on the spine are particularly attractive. 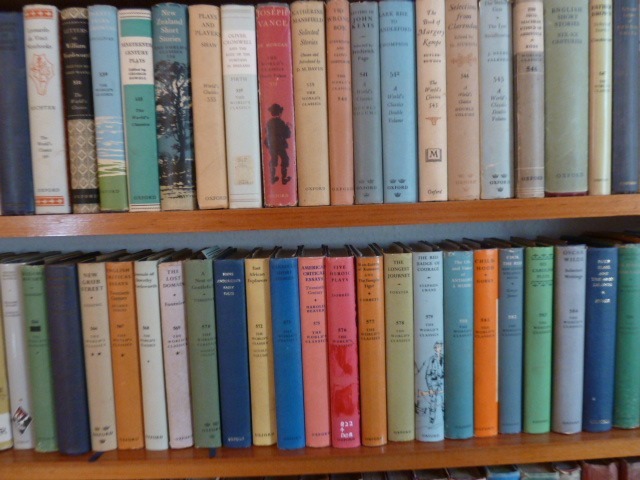 By 1920, the format of the books had become more modern - mainly blue cloth (though some in green, maroon and one or two other colours) with standard dustwrapper designs. 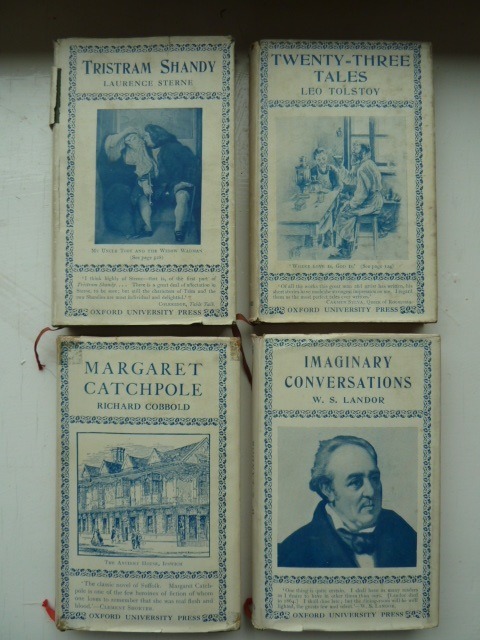 Later again, the cloth settled down at dark blue, finally becoming black towards the end of the series, with more pictorial dustwrappers becoming the norm. 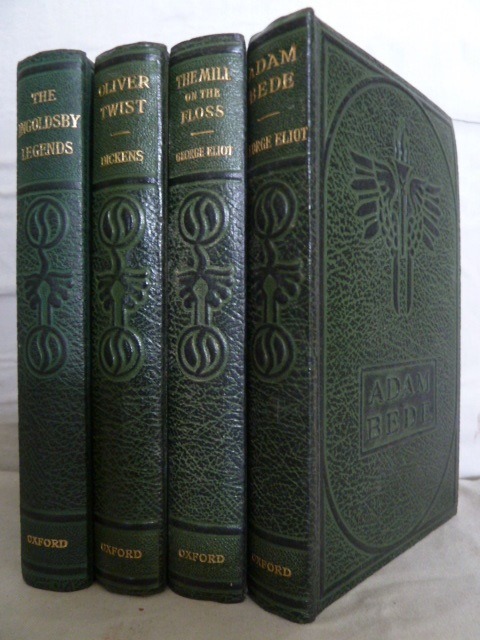 There are many variants, some were leather bound for example, and most titles were re-printed many times in the different styles. 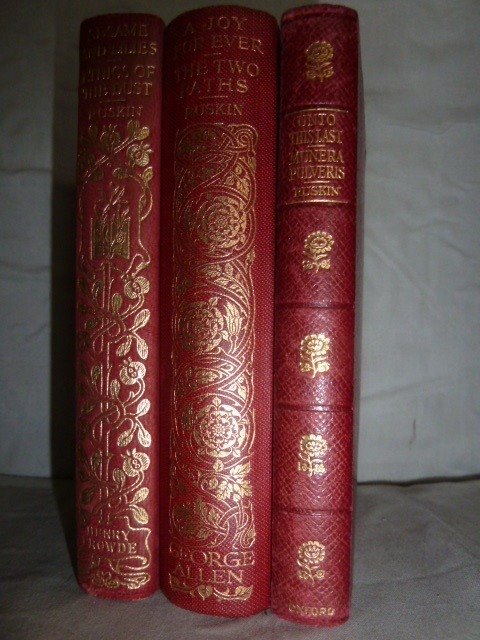 Works of John Ruskin, the only author in the series for which the volumes did not carry a number. 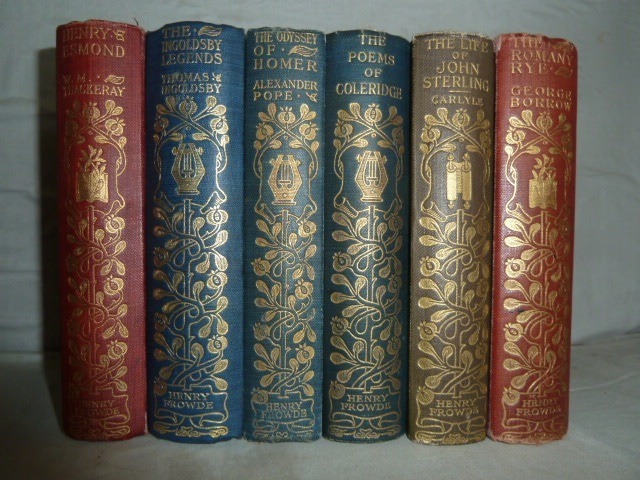 These carry the emblem 'Ruskin House Edition' and note George Allen is the publisher of 'A Joy for Ever'. 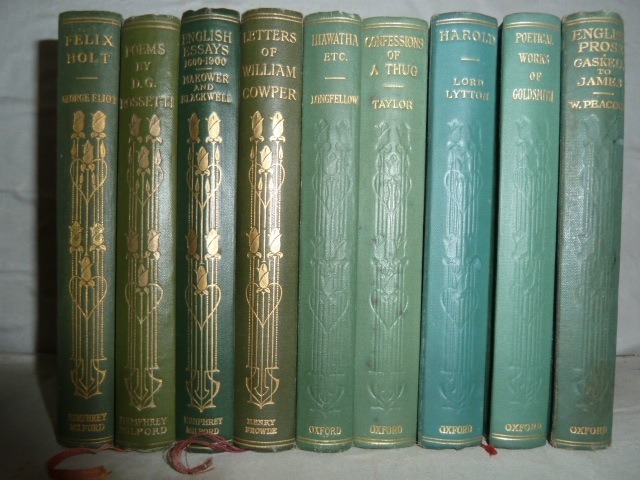 These volumes were published between 1907 and 1923). (Series numbers 145, 147, 148). The standard green cloth used after the original decorative bindings. 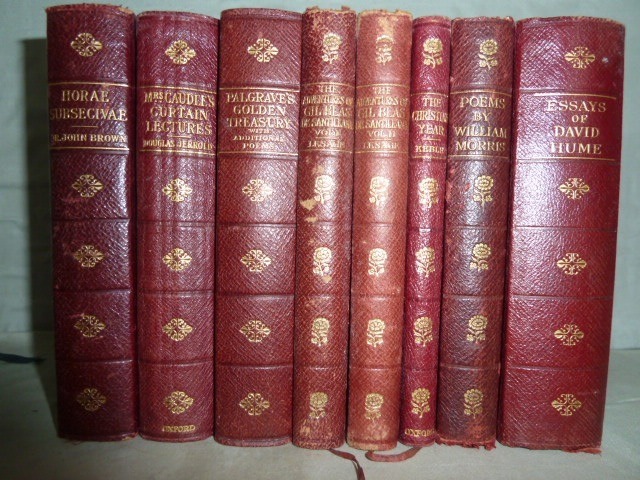 These volumes were produced between 1911 and 1928. (Nos. 123, 129, 138, 165, 172, 174, 185, 207, 223). 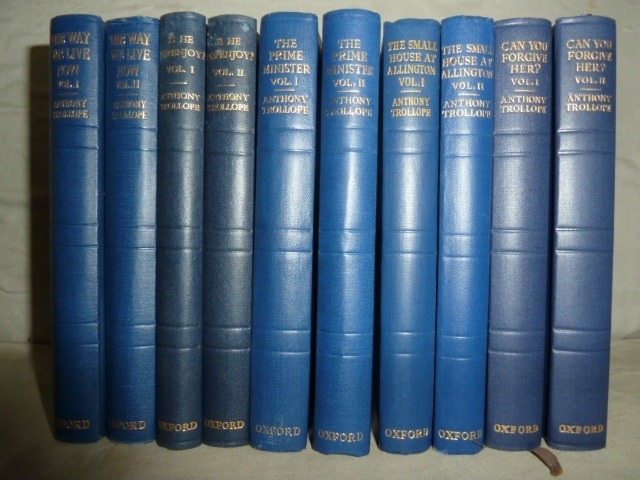 The last OUP World's Classics in their original form petered out in the mid 1970's as the last reprints emerged and a glorious era in book production came to an end. But then in 1985 something strange happened - in a last sad reincarnation of the series Chinese reprints of some of the titles began appearing, with identical texts and pagination to the books in the original series. This persisted until 1987 and I have seven of these published variously by Chancellor Press, Avenel and Hamlyn. 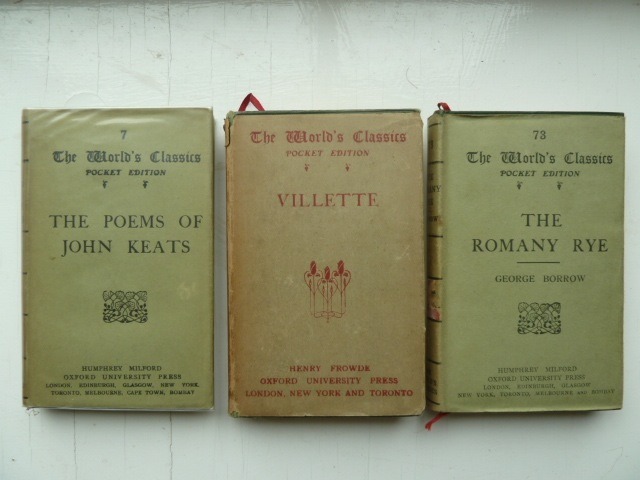 In conclusion, collecting World's Classics is an absorbing endeavour, with many choices to be made considering that most titles (particularly the early ones) came out in several of the various binding styles and dustwrapper designs used by the publishers. 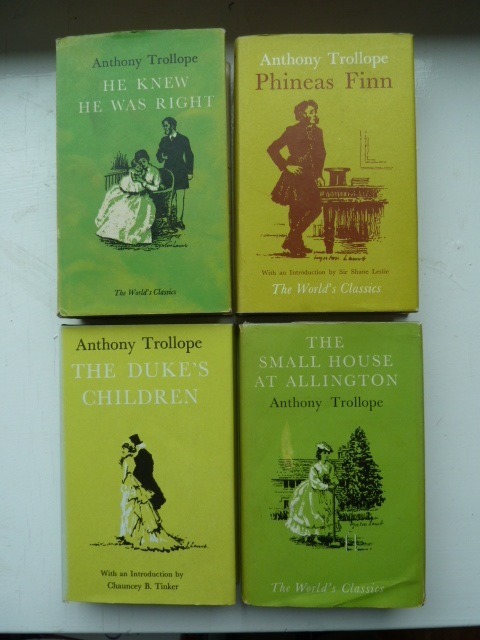 A set of Trollope all in blue cloth looks superb but then you would sacrifice the elegant Lynton Lamb dustwrapper designs. 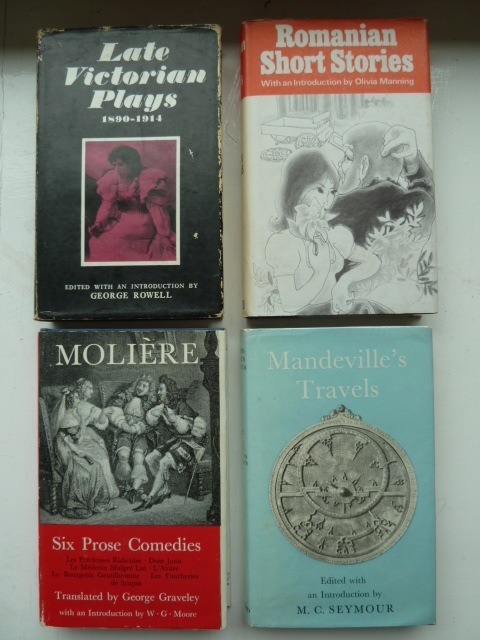 So it is best left to chance - buy what is there and over the years as if by magic lovely groupings will appear that could almost make you believe you had planned them from the start! May your library flourish alongside family and friends. Stunning and thrilling. I collect this series, as well. I’m sure it will absorb me for years and years. 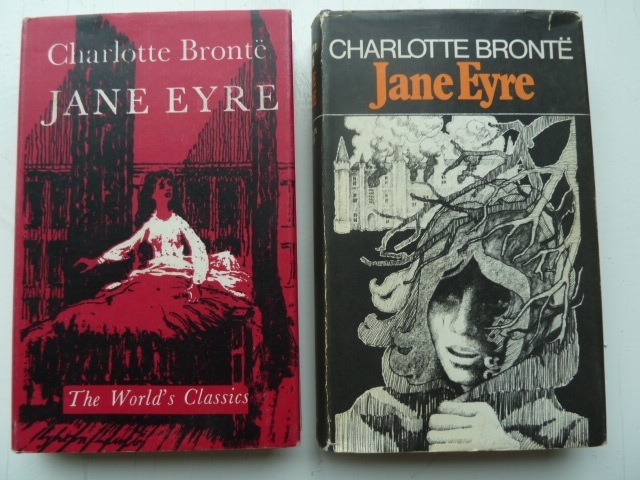 Sometimes i dream of a cross-country book hunt through the UK, hoping that if I skipped the Internet I could still find these treasure in the $5 range. 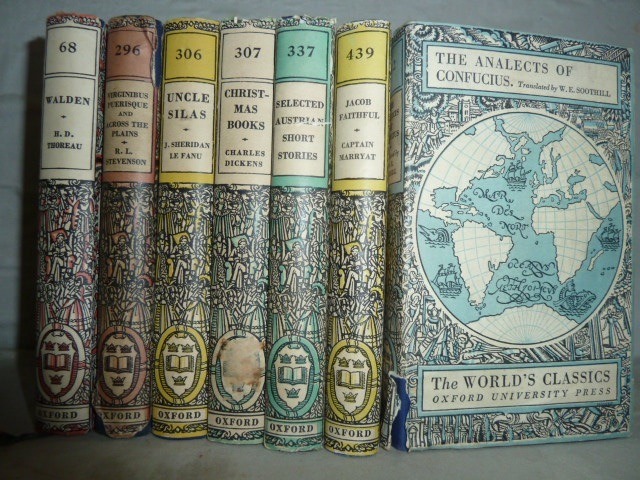 I'm very fond of these hardback OUP World's Classics as well. 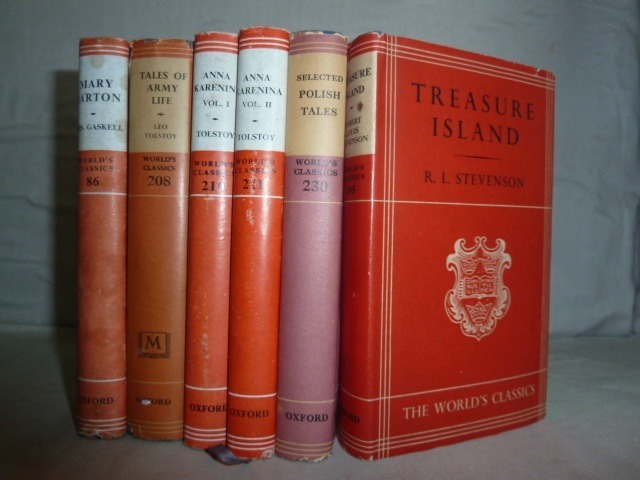 I discovered them through the 1987 series - of which I bought Barchester Towers, and then looking for the other Barsetshire Novels could only find them in the original OUP hardcovers. One question you might perhaps be able to answer: why is it that Charles Dickens appears not to have been published in this format? As I see this enormous wealth, there descends upon me a great sense of peace, possibility, and anticipation. Thank you for sharing this! It is a wonderful reference. Thank you for giving me all the information I wanted in a single post! I have noticed the blue spines popping up in our book fair finds and realised that they were a series and thought maybe I could look out for them. It was hard to find out more about them, the numbers and the titles. I have a much better understanding. I like the limitation you set on yourself and will most likely do the same - book fair only, and for me a second restriction - non fiction.